la la la la la! (hitting high notes and clearing throat) Maligayang Pasko at Manigong Bagong Taon! This is how we say it in the Philippines which of course means Merry Christmas and a Happy New year in America. A simple wish to all my SITStah who are participating in the 2nd Merry SITSmas card event. My first year was fabulous & I'm sure this year would be as exciting and full of fun, if not more. 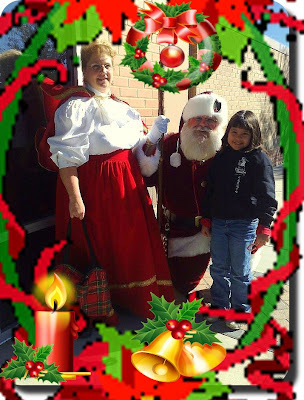 So to all my SITStah from Santa Claus & Mrs. Claus, my Family and my blogs, A merry SITSmas! And to all a good night (ok, I got carried away there for a minute). Seriously, I wish everyone a wonderful and fruitful holidays ahead! Hope all your wishes come true! Thank you for stopping by and bringing me great tidings today! For those who hasn't experienced the joy of SITSmas, come chime in your silver bells and win great prices in the process! Fa la la la la la la la laaaaaahhhhh!!! Merry SITS Christmas!!! Love the Santa picture! I love the picture!! Merry SITSmas!! Thanks for the well wishes. Merry SITSmas to you as well. Hope you had a very merry SITSmas Maricris! Merry day after SITSmas!! Your daughter is just adorable!! Merry SITSmas to you and your little elf! Thanks for visiting my blog.